HOLE TRUTH: Flight 77's landing gear punched a 12-ft. hole into the Pentagon's Ring C.
The red writing on the right side of the opening "Punch OUt" is the big giveaway. The orange circled 'V's directed the backhoe operator to make the opening within the V's. Note the orange arrow on left edge of the opening. The bricks on the edges have been clawed away from outside by backhoe teeth. IT IS CRYSTAL-CLEAR that this wall opening was made by contruction workers needing to access the inner Pentagon NOT by a landing gear as claimed by Popular Mechanics. Would somebody tell Popular Mechanics? This is a hole in -- there was a punch-out. They suspect that this was where a part of the aircraft came through this hole, although I didn't see any evidence of the aircraft down there. and it was not caused by a backhoe. 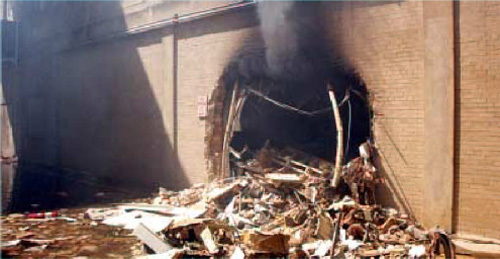 The exit hole is very important evidence to indicate a government cover-up because it can't be explained by an aircraft hitting the building. 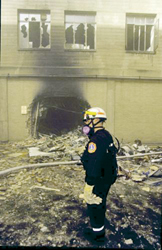 Witnesses claimed it was caused by the incident on 9/11. The markings on the wall (see photo at bottom) to which Jon refers are international rescue symbols, not backhoe directions. 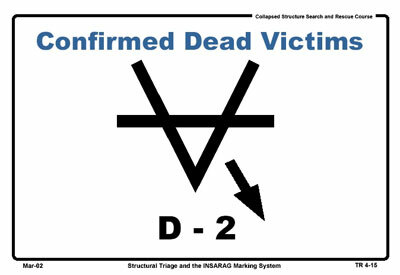 The "V" indicates a victim has been located. 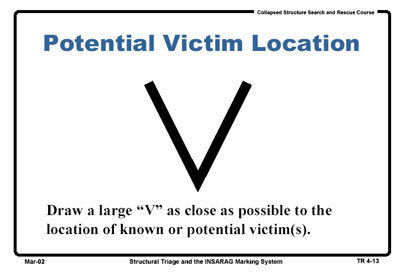 If there is a line through the V (an upside down "A") that indicates the victim is deceased. If there is a circle around it, that means the victim has been removed (see graphics at bottom). Following is the first known photo of the exit hole. The photo was taken before hose lines were even laid. No backhoe or aircraft parts are apparent. 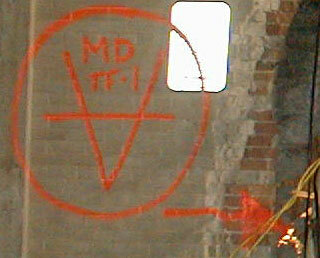 If the backhoe operator was directed to the hole by the symbols on the wall, where are the symbols in this photo? The symbols would have had to have been there first. Also, if they had a backhoe there they would have had protective fire lines and there would most likely be people and hose lines in this photo. My final point is that the debris pile doesn't impress me as having been placed by a backhoe. It would have been piled to one side or the other, not right in front of the hole. I don't think we can dismiss the exit hole with "natural causation" as an explanation. In Jon's link "Pentagon construction contractors have the FINAL WORD"
there seems to be conflicting statements. There were two made by Terry Mitchell (Chief, Audiovisual Division, Office of ASD PA) who contradicted himself, and one by Lee Evey (Pentagon Renovation Manager) that contradicts one of Mitchell's statements. MITCHELL: "You can see someone from the Montgomery County unit here. This pile here is all Pentagon metal. None of that is aircraft whatsoever. As you can see, they've punched a hole in here. This was punched by the rescue workers to clean it out. 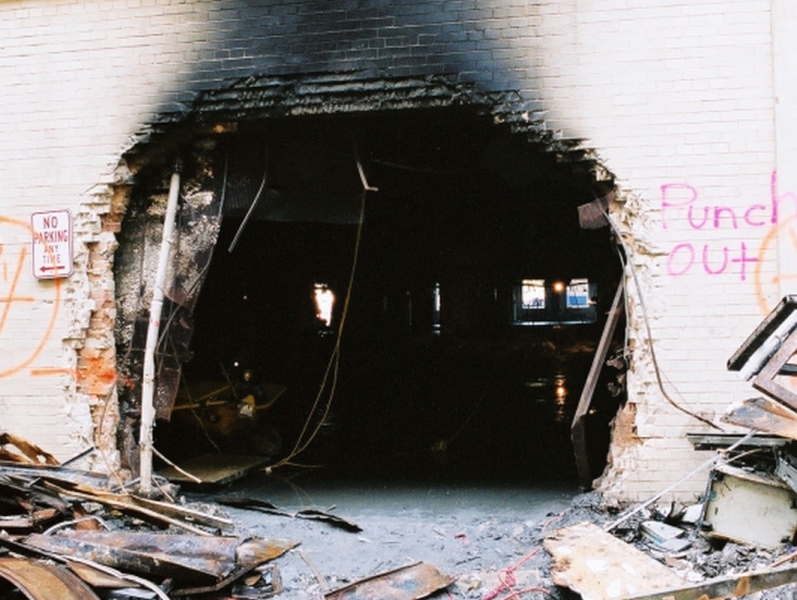 You can see this is the -- some of the unrenovated areas where the windows have blown out." MITCHELL: "It's more to the right of where we were at. This is the -- this is in a renovated section on the opposite side, if you were facing the opposite side. This is a hole in -- there was a punch-out. They suspect that this was where a part of the aircraft came through this hole, although I didn't see any evidence of the aircraft down there." EVEY: "The rings are E, D, C, B and A. Between B and C is a driveway that goes around the Pentagon. It's called A-E Drive. The airplane traveled in a path about like this, and the nose of the aircraft broke through this innermost wall of C ring into A-E Drive." My opinion is that it was not the nose of an aircraft. For more analysis of the exit hole you can visit my site. 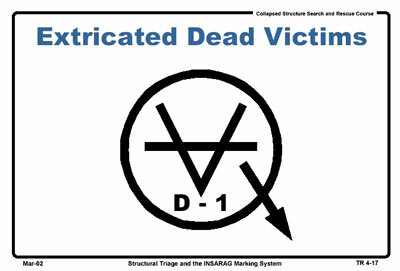 The following graphics demonstrate the use of the rescue symbols. The source is at the bottom. Here is the .pdf to reference these graphics. The "MD TF-1" is for Maryland Task Force 1. The arrow would be pointing to bodies and body parts inside the exit hole.